Rapid Lawn Landscape Solutions Ltd. is the Regina landscaping company you can trust. We have helped many customers achieve the yards they have always dreamed of. In our latest article, we share some consideration for your Regina outdoor kitchen hardscaping design ideas. Most people tend to think of the fundamentals with kitchen design, such as how they will cook and serve guests, but some of the small enhancements that make a big difference can easily be overlooked, particularly in an outdoor space. 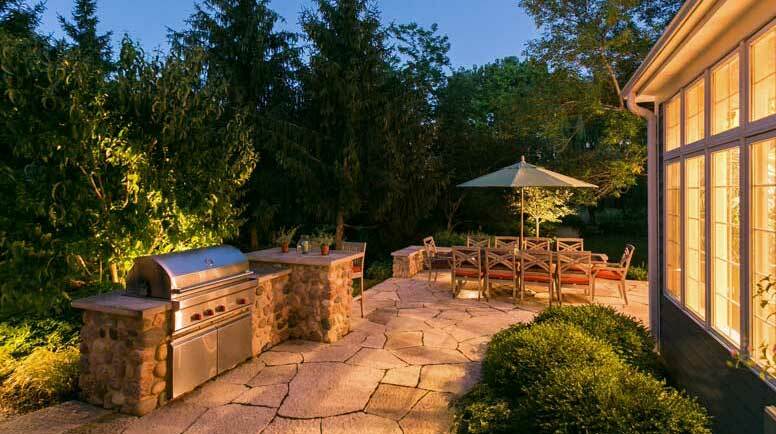 Here are some things you should cpnsider when planning your outdoor kitchen. A growing number of today’s families have three (or more) generations living under one roof, or even if they don’t live together, many extended families spend a lot of time together. This togetherness may create more need to accommodate those who have mobility challenges. Take this into account in your outdoor kitchen space by ensuring some of your countertops are wheel-chair accessible, including access ramps where necessary, and selecting flooring surfaces that will accommodate walkers and wheelchairs. Many homes are outfitted with the coolest high-tech gadgets. Thankfully, with today’s advances, there is little distinction of what belongs indoors versus out, which means all the fun toys don’t have to stay indoors! There are special sound systems and televisions that are designed for outdoor use. They are built to withstand temperature variations and a wide range of weather conditions; sound systems are even available in different design styles to compliment your living space. Super Bowl and Final Four parties or political debates can all be enjoyed around the sitting area of your outdoor kitchen over dinner or snacks. Make sure you have internet access outside as the indoor signal may not be strong enough for the access you’d like to enjoy outdoors. And while you may think your smart phone’s signal will provide all the browsing and wireless access you need, continued and increased reliance on the internet will necessitate strong connections for you and visiting guests. Don’t underestimate the right lighting for your outdoor kitchen if you plan to use it at night. You will need bright, clear lighting in the cooking area to be able to slice and dice safely and you will want more ambient, comfortable lighting in your seating and dining areas. Roofs, pergolas, and awnings can all provide cover to parts of your outdoor kitchen to expand your exterior living space, even during periods of inclimate weather. Once you know how you will use your outdoor kitchen, consider having some built-in seating and storage included. Built-in benches can add a cozy seating area, and they can hide storage compartments that can house many of your outdoor accessories. Built-in shelving can be added to store logs for a wood-burning pizza oven. Many people think water features are only for the yard. In fact, they can work quite nicely as part of an outdoor kitchen as well. A small fountain will delight guests and may invoke reflections of days gone by in Europe. An aquarium or even a small fish pond will fascinate children young and old. Once you have built the outdoor kitchen of your dreams, you will want to spend a lot of time there. A little advance planning of some of the important features – beyond those for cooking and cooling – will help ensure your ultimate enjoyment of your kitchen retreat. Rapid Lawn Landscape Solutions Ltd. Ltd. is your one-stop Regina landscaping company. We have experience working on several large and small-scale commercial projects. Our equipment and our team are ready to tackle a variety of commercial landscaping jobs from snow removal to hydroseeding and anything in between. We also have access to an extensive network of professionals across Saskatchewan and Canada so give us a call to get your project started.